Today we are looking at the signing habits of former Notre Dame Fighting Irish head football coach Lou Holtz. I have encountered Coach Holtz on a couple of dozen occasions over the years. I have found him to be a fantastic guy and a very willing signer. He is very friendly, loves interacting with his fans. Although he has had other coaching stops, he is still a huge Notre Dame fan. I don’t believe I have ever seen him decline an autograph request. 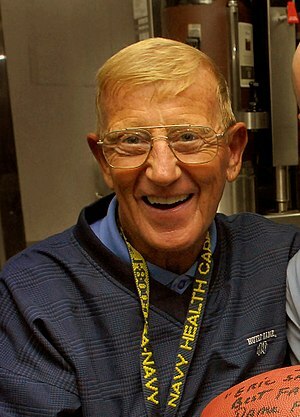 So if you ever get the chance to meet Coach Holtz, by all means ask him for his autograph. He will not let you down. Also, don’t forget to ask him about the Fighting Irish. Hope you enjoyed today’s blog. Check out my web store at www.autographedfirstdaycovers.com. This entry was posted in Uncategorized and tagged college football, frank leahy, knute rockne, national champions, ncaa. Bookmark the permalink.